Most people know more about the different breeds of pedigreed dogs than they do about pedigreed cats. Since late in the 1890’s records have been kept on the bloodlines of cat breeds and the cat fancy has grown over the years to encompass most of the continents. At this time, there are many pedigreed breeds of cats, the actual number varies depending upon the association or resource you ask. CFF currently recognizes at least 32 different breeds for show. 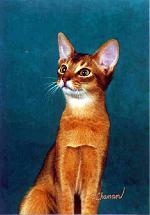 Experimental and Provisional are a show class for new breeds of cats, this class is allowed to be exhibited and judged, but cannot be awarded titles. Breed profiles are a basic description of the breed of cat. For breed standards, which are used when judging a cat, please click on the breed name. The GENERAL PREFACE applies to ALL the standards. If Abyssinians were the ancient Egyptian cats, is it any wonder that they were worshipped as gods? Elegant, energetic, and inquisitive, Abys are the natural athletes of the cat world, Michael Jordan might spend his next life as an Aby. They prefer shoulders to laps. Dog-like and easily trained, Abys make excellent pets for families that have dogs, children, and sports fans (men). The long hair model is called a Somali. If you either of these breeds you’ll have a cat who stays a kitten throughout its entire life. The American Curl is a relatively new breed. The breed name is due to the characteristic of their ears curling backward. The curl results from a genetic mutation, not a curling iron. The American Curl comes in both long and short hair versions. They have a silky coat, a body that is long and lithe. They are a very active breed, affectionate and inquisitive. The American Shorthair is said to have been on board the Mayflower, brought along with the Pilgrims to be mousers. They have a sturdy body, plush coat and come in all colors except pointed, the Tabby pattern being the most popular. They are intelligent and playful, an All-American pet. The Balinese is the long hair version of the Siamese. They possess the same elegant body form and dramatic markings. They have a long silky coat, a feathery tail. They are as affectionate and demanding as their Siamese cousins. Bengal cats originated by breeding a domestic cat to an Asian wildcat, then developed by outcrossing with several other breeds. The amount of “wild” genes is now said to be about 10%. An inquisitive active breed, they love to climb, are said to like water. They enjoy the company of humans and other pets alike. They look like miniature leopards, reminding you of their wild origins. The Birman is known as the Sacred Cat of Burma. It’s origins are said to be mystical, but however it began, the breed is lovely. They have white gloves and laces on the back feet which are like little socks that come to a V. They have a thick luxurious coat, a Roman nose, a sturdy body and truly Zen personality. They only come in pointed colors. Bombay: Bombays are friendly and outgoing, and make intelligent, affectionate companions. They do well with children and other animals. The coat is the most defining characteristic of the Bombay. Its coat is short and flat. It is gleaming and black to the roots! British Shorthair cats have remarkably thick, plush coat. These cats have wonderful round faces and cheeks that make you just want to pinch them. They are native to Britain but have been bred in the US for many years, being developed into a massive teddy bear. They have amiable personalities, are playful as kittens, but become more relaxed as adults. “Brits” come in every color and pattern but are not accepted in CFF in the pointed pattern. The Burmese are extremely people-oriented. They have been compared to dogs as they love to follow their owners around and give and receive more attention. The Burmese may not appear to be a large cat but they are normally heavier than you may think. The Burmese coats are very short and satin like. They generally require little grooming. The Chartreux has a muscular body, broad shoulders and a deep chest. The Chartreux’s blue fur is medium in length and woolly. The Chartreux is known for its smile which is caused by the shape of its’ head and narrowed muzzle. The Chartreux is a quiet breed and chirps rather than meows. 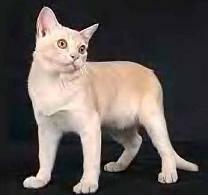 The Cornish Rex has a wavy coat like the Devon (which is caused by a genetic mutation called marcelling). They are often called the “greyhounds of the cat fancy” with their soft velvet waves of the coat, large ears, and racy looks. 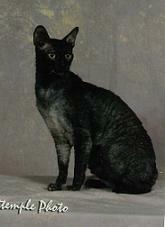 The Cornish Rex is alert and has an intense interest in its surroundings and people. This trait makes them a true ruler of the household. 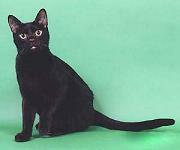 The CYMRIC is a muscular, compact, medium to large cat with a sturdy bone structure. Cymrics have large and full eyes and have widely spaced ears. The hair of a Cymric is medium-long, dense and well padded over the main body. In the breed of Cymrics, four different tail types are produced. The “rumpy” is the most valuable. This is a cat born entirely tailless. Next, there are “rumpy-risers”. These cats have a short knob of a tail that is made up of one to three vertebrae connected to the spine. “Stumpies” have a short tail stump that is usually curved, knotted, or kinked. Finally, “longies” have tails almost as long as an ordinary cat’s. However, most breeders dock the tails of longie kittens four to six days after birth. The Devon Rex is a medium-sized cat who is covered with wavy fur that comes in all colors. Their ears are amazingly large, low on the sides of the head. This trait causes them to look like E.T. or Yoda. They shed very little, producing less dander, making them a good choice for people who are allergic to cats. The Devon has a quiet voice, is active, clownish and intelligent. They prefer human company to other cats, and adore your attention. 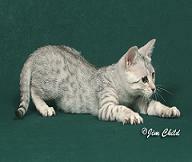 The Egyptian Mau has the distinction of being the only natural spotted breed of domestic cat. They have an elegant body that is randomly spotted. They have banded legs and tail. They have expressive gooseberry green eyes with distinctive mascara lines. They often have a worried expression on the face. An extremely intelligent animal, the Mau is very devoted to his human family. They are moderately active and very inquisitive. The Exotic Longhair / Exotic Shorthair is a hybrid breed of the Persian. Established by breeding a Persian to a American Shorthair or Burmese. The Exotic Shorthair, nicknamed the “lazy man Persian” has a medium length plush coat, while the Exotic Longhair coat length and texture is the same as the Persian. The Exotics body type and head are the same as the Persian. An advantage of the Exotic is that it can be found in all the Persian and Himalayan colors in both the long and short hair versions. Foreign Burmese: Wong Mau was the first Burmese. She was brought to America from Burma by Dr. Thompson in 1930. 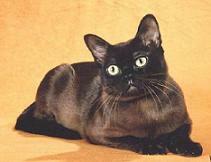 As Wong Mau was the only example of her type she was to the next closest type of cat, the Old Style Siamese. Not only did Wong Mau breed true, but her her kittens did also. In 1949, three Burmese were sent to the United Kingdom where the same lack of breeding stock led to the introduction of Old Style Siamese again. This is when a a red/flame point Old Style Siamese introduced which created an additional six coat colors, making a total of ten colors -Brown, Chocolate, Blue, Lilac, Red, Cream, Brown-tortie, Chocolate-tortie, Blue-tortie and Lilac-tortie. While Burmese in America became more round and compact over the years, Foreign Burmese have remained an elegant, moderate cat with gently rounded contours. Both types have a sweet disposition, are highly intelligent, affectionate and loyal. They make outstanding pets. The Havana is a hybrid or man-made breed which was created in the 1950’s. The most unique thing about the Havana is the glistening mahogany-toned glossy brown coat. The coat is smooth and lustrous and feels like mink. The Havana Brown has a playful personality. They are a people cat and enjoy human companionship. This is the perfect cat for the person who wants a sociable, affectionate and intelligent pet. 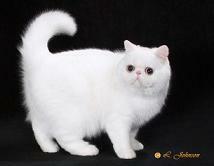 The Himalayan, currently the second most registered cat in CFF is a hybrid breed of the Persian. 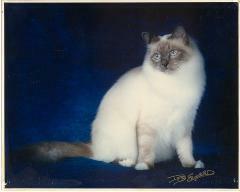 The Himalayan resulted from breeding a Persian with a Siamese. Once only accepted in the pointed colors, it is now also recognized in most non-pointed Persian colors. 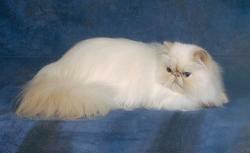 The non-pointed Persian colors resulted from additional breeding a Himalayan to a Persian. The “Himi” follows the same cat show standards as the Persian in CFF as to their type and are shown in separate color classes from the Persian. The Japanese Bobtail is a natural breed and as its’ name implies comes from Japan. Japanese Bobtails are strong and healthy cats. The tail of the Japanese Bortail is very unique! Not only is it unique to the breed but to each individual cat. No two tails are ever alike. The Japanese Bobtail is active and intelligent. They are also talkative cats. They do well with other animals, and are excellent with children.